Behavioral email is an email based on the actions that your customer does when interacting with your business. It makes possible to send valuable emails which matter to every recipient. How to start sending behavioral emails? You want to create your strategy around the key points of the buyer’s journey and get the maximum utility of every email without excessive bother. On the way to the users’ love, emails are milestones, which provide timely support, but do not act like annoying advertising banners. So even if your process is not very complicated, start thinking about when it is the best to push your customers. The increase of the click-throughs numbers depends on the time of communication with customers. Choose the right time! There is a great choice of ways to collect data about your users and customers. While free tools like Google Analytics are excellent examples of where to start, there are more advanced tools that allow you to track the dynamics of your users. The inclusion of the user’s name into the text of your email is not considered to be personalization. Real personalization is a behavioral email. In other words, unique emails sent to each user with an individual message and a call to action. This is possible by tracking behavior. Include "recommended products" to the email. Adding additional data from the server is not a difficult task, and if you do it correctly, you will provide your customers with highly reliable buying options. The key to the click-throughs increase is to think bigger. 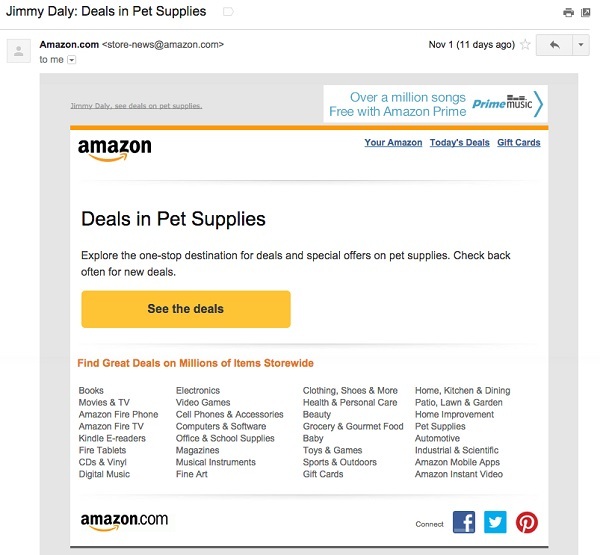 Forget what you know about the bulk emails and begin to reveal the power of behavioral emails. "In one click you can get acquainted with all the offers and special promotions in the section of goods for animals. Check more often to find new offers". Americans spent 55 billion dollars on their pets in 2013. Amazon quite naturally identified his new client as a pet owner, basing on his purchase history, and expects that the amount spent on his dog will only increase. This behavioral email is good because of its directness. Essentially, it says: "You know, you need different things for your dog and you need to save some money for this". The eye-catching yellow button makes the next step quite obvious. Also searched with "Behavioral email"
Rate this article about "Behavioral email"
If you are interested in "Behavioral email" you might be interested in our bulk email service.